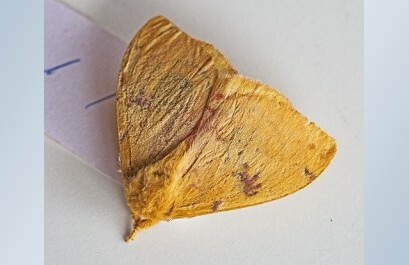 New IO Moth Photography. IO Moth is a new set of stock photos by Ernie Hunter.The IO Moth, pronounced i o just like the letters, is one of our prettiest moths. The male, seen here, is a golden yellow,not unlike light brown sugar, and the female is much darker with reddish brown forewings, body, and legs. They both have the blue/black eye with a white dash in the middle and a black and red outline below it. This eye effect is believed to frighten off predators as they think someone is watching them. The pale green caterpillar has red and white stripes and poisonous spines. (Automeris io)View more stock photography by Ernie Hunter here.